As a business owner, your success is intertwined with your employees. If your employees aren’t motivated to work harder, smarter and more efficient, your business will suffer. Good employee training is critical to keeping your business afloat and is best delivered as a continuous practice. Most business owners agree with the first part, but have never thought about the second. New employees often start with massive momentum. They are eager to learn, eager to contribute and eager to be a part of the team. They also feel a need to prove themselves. They start out with a bang, often landing astonishing results in a short period of time. Everything they do feels like continuous improvement. But eventually, they hit a plateau. They aren’t growing. They aren’t reaching that next level. Determining how to train employees effectively is a critical part of running a successful business and retaining talented people along the way. So how can you create an employee training plan that will help you train employees to overcome plateaus and potential setbacks and see incredible results? In three simple steps, The Training Effect can help any business owner ignite the winning fire in their employees. The first step to excellent employee training is continuous immersion. When an employee first starts, you spend a lot of time training them in your processes, but what happens after? If you train an employee once and then never revisit that skill, you are doing them a disservice. Effective training strategies are much like effective fitness strategies. While you may feel like you’ve hit the ground running after just a month or two at the gym, if you don’t continuously change things up and challenge your body, you’ll never move past that plateau and achieve your fitness goals. From there it becomes easy to fall behind and grow disillusioned with your efforts. You don’t want to cultivate this feeling in the people who work for you. Instead, you want to cheer them on and make them feel like they can achieve anything they put their minds to. Part of your role as their boss is to do just that. Are you regularly immersing your employees in new strategies that will not only help them grow, but your business as well? Are you identifying their weaknesses and giving them the proper training to turn them into strengths? When determining how to train employees effectively, don’t forget that training is ongoing, even after they are no longer considered new. The best employees are the ones who are regularly improving their skill set. The second step of The Training Effect is quality coaching. We’ve established that it’s not enough to just train employees once and let them go off on their own. But it’s also not enough to create an employee training plan and never check in again. That doesn’t help your employees or your business; ultimately, setting them loose with only guidelines to follow and no one to encourage them and hold them accountable will only do them a disservice. Schedule regular meetings with employees to discuss their progress and identify future areas of growth. When you’re having open and honest conversations with your employees, they’ll know what you expect from them and in return, they’ll continue to work harder. If an employee is having problems in a specific area, craft new strategies to help them get through it or determine whether they might want to move to a new area. Show them that you value them and want to help them improve or move to an area where their skills will be put to good use. If you aren’t capable of helping them yourself, help them seek out a mentor who can. Give them reasons to grow within the company – your business will thrive as a result. The final step is what will ensure lasting success – consistent spaced repetition. Mastery isn’t linear. No matter what, your employee will likely still reach plateaus, but as long as you continue to implement and repeat the first two steps, these plateaus will turn into launching pads for their next level. We return to the fitness analogy: The more you work out, the stronger you get. The more you repeat a task, the better you get at it. Building out effective timing is key for effective training strategies. Maybe you meet with your reports every month or have them attend a workshop every quarter. Each department is unique, and each employee within that department is unique, too. The thing to keep in mind is that employee training never stops – even if someone has been with the company for decades – because as humans we never stop learning. With regular immersion and training, your employees will work harder, smarter and be more fired up to achieve success – and they’ll be better equipped to share this knowledge with other, newer employees. Good employee training doesn’t just help a person become a good employee – it’s part of what helps them grow into an effective leader. Tony Robbins’ Training Effect isn’t just a course in how to train employees. It emphasizes never-ending improvement, and that works in every area of your life. You and your employees can take these strategies home and implement them elsewhere, creating positive changes and leading to a lifelong appreciation of learning and adapting, which are critical if you want to adapt in a world that changes at a breakneck pace. For any business, implementing this in your employee training plan will help you create employees who are equally committed to your business’ success. Are you ready to get started? 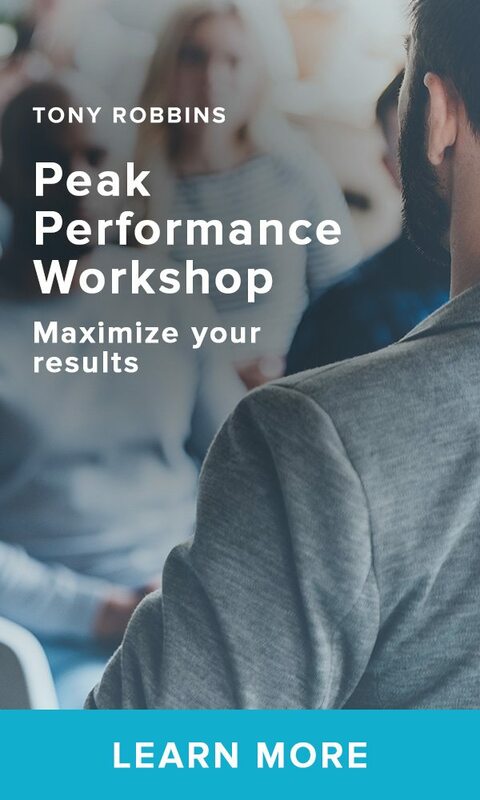 The Peak Performance Workshop is a complimentary training designed to massively improve the areas every business struggles with. Expertly trained to ignite that inner fire and create a winning team for your business, Peak Performance Strategists are the catalyst your business needs to grow. In just one hour, a Tony Robbins Peak Performance StrategiståÊcan create an immediateåÊshift in your team's performance.